Unconfirmed reports have been received by West Papua Media from reliable sources in Paniai district, West Papua, that troops from the notorious Indonesian Army (TNI) Battalion 753 Arga Vira Tama (from Nabire, Korem 174 – Kodam XVII/Trikora) are currently conducting major house to house sweeps in the remote hill areas outside Wegamo. At least three companies of the Battalion 753, a unit linked to ongoing brutal human rights abuses and regular incidents of torture in Paniai, have been parachuted into the the headwaters of the Weya Creek of Bibida district in Wagamo, Paniai, according to credible human rights sources. Reports are filtering through that the TNI is searching the villages around Weya Creek for the Paniai OPM/TPN leader John Yogi, who has eluded capture after a massive offensive that has displace over 12,000 since it began in November 2011. However, Yogi has not been seen in the area according to local sources, who report that the local civilian population is bearing the brunt of interrogations and abuse from 753. Witnesses have reported that troops from 753, supported by Indonesian Brimob police units, have been launching aggressive raids in villages since the evening of September 4, detaining and interrogating all villages and destroying property whilst seizing sharp items, including farming tools necessary for subsistence agriculture. This is prompting fears of a repeat of the humanitarian crisis that developed last December when troops from 753 Battalion torched and destroyed food gardens, forcing thousands to flee to police run “care centres” in Enaratoli. During the 2011 campaign, several people died of starvation and sickness in the care centres, whilst security forces attempted to capture Yogi. It is unclear at this stage whether special forces troops from the Australian funded and trained counter-terror unit Detachment 88 are involved in this action, given their presence in major offensives throughout 2012 in pursuit of Yogi. Disturbing reports from trusted sources have also emerged from the town of Moanemani, Paniai, of a major influx of combat troops and paramilitary police into the town since the weekend. Fears are being expressed by credible community sources that a major crackdown is expected by security forces, because the military and police are stopping people in the street and ordering them to shave off moustaches and beards. Local Papuan people traditionally wear facial hair as an assertion of Papuan identity, an act seen as separatist by clean-shaven Indonesian occupation forces. Sources have also reported that civilians have been warned to bathe and wear new and clean clothing ahead of an expected offensive, and that local people are terrified that they are to be suspected and targeted as being OPM members, based purely on their traditional appearance. 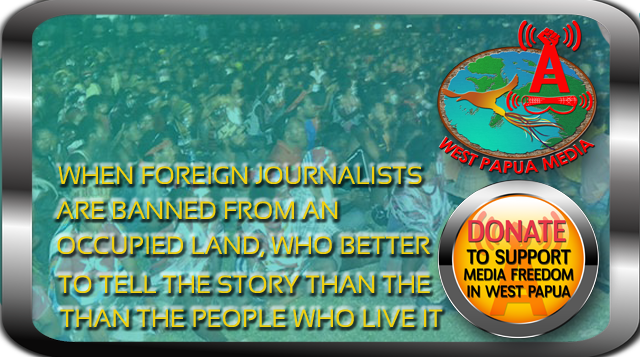 West Papua Media has been unable to independently verify these reports, however these action are in line with ongoing offensives and abuses by security forces across Paniai regency in recent months. Moanemani was also the site of a vicious spate of unprovoked killings by Indonesian security forces of civilians early in 2012. It’s not because those awful killings are done far away of my sweet home that I can stand them. Shame on People who are conducting those Criminal behavoiour and every Humain beings condamne those attrocity! Shame on Indonesia, we have seen what you’re capable of in Timor Leste: the worst and finally the Best, by letting them FREE. DON’T WAIT any longer, don’t destroy anymore, LET PAPUA BE FREE!